Earlier this week, a Chinese man was camping with friends in the Huairou region when he seems to have spotted a monster-like creature that somewhat resembled Gollum from Lord of the Rings. The man said he was "terrified." He snapped photos and uploaded them online. They spread like wildfire. When the photos hit, there was one net user who claimed that they were for a fantasy short film he was making with friends. The claims have since been refuted, but they continue to be mentioned online in China by some, when debunking these photos. 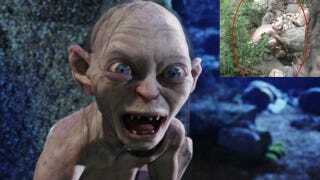 So, yeah, this isn't actually Gollum. How do I know this? Because Gollum doesn't really exist, that's how! Crazy, I know. But it gets even crazier: ET Today reports this is a man dressed up to promote online game Guild Wars 2. Apparently, he was mistaken for being an actual monster, whether that's Gollum or Dobby from Harry Potter or whatever. The game's official Chinese social networking account uploaded behind-the-scenes photos to show that, yes, this is just a photo shoot to promote the game. ET Today reports that the actor was getting a drink from the stream when his photo was snapped. Though, The Telegraph reports the local Huairou government states, "The actor was taking a loo-break and was still wearing his costume". The Guild Wars 2 Chinese social networking site added that this wasn't for a short film, but an ad for the game. It also clarified that this "monster" was Asura, a Guild Wars 2 in-game character race, and it apparently even set up a hashtag (#怪兽实为游戏平面 or, loosely, "The monster was really video game marketing material") to help control the rumors that this is a real monster.